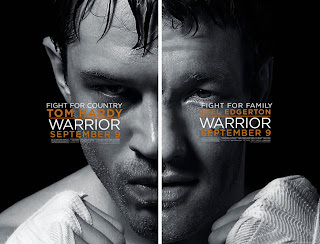 I don't hesitate to say that I didn't have much interest in "Warrior" upon seeing its first trailer. It looked to be a somewhat cheesy inspirational story based around the consistently growing in popularity sport that is mixed martial arts. Suffice to say, it is definitely an inspiring film and one that rivals last years "The Fighter" as a down and out great film in the realm of fighting movies. It makes you feel the same way those who saw "Rocky" when it first came out no doubt did. 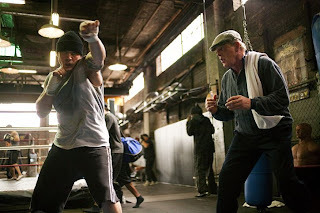 It may not end up being the heavy Oscar contender that "The Fighter" was and no it certainly doesn't have Christian Bale in a whirlwind performance, but Nick Nolte comes pretty close and both Tom Hardy and Joel Edgerton deliver powerful, while polar opposite performances that not only make this a moving sports film, but a family drama that builds to a point where the sport is simply a metaphor for the struggle and pain that has burdened these brothers for years. father (Nick Nolte) in "Warrior". Director Gavin O'Connor who also helped pen the screenplay really puts the emphasis on the characters here rather than the sport at the center of it. This not only allows for the amazing fight scenes he has composed to magnify how strongly the need to win weighs upon both brothers shoulders but it also makes for a film that is just as tough emotionally as it is physically. 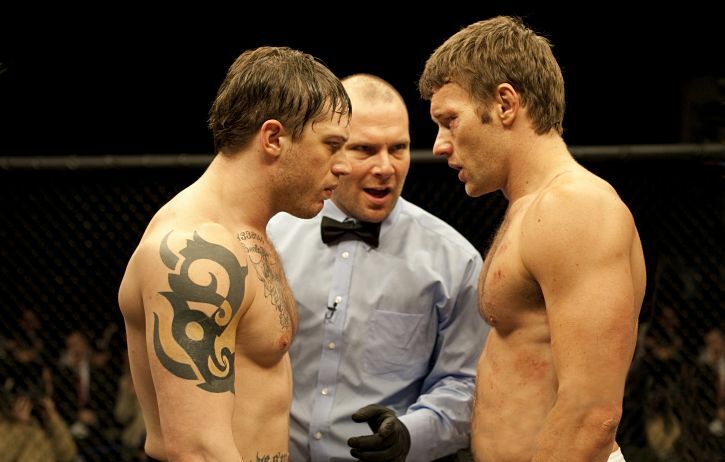 As Tommy, Tom Hardy is a bruiting, silent monster that has seen nothing but bad times since he fled from his father and brother with his mom when he was younger. After years of not knowing or keeping in touch with either his father or his brother Brendan. Tommy shows up on his old mans doorstep asking for a trainer. His motives are unclear, his intentions even more muddied but the moment we see him enter a Pittsburgh practice ring its obvious the guy has some serious skill. As the recovering alcoholic father who clearly never treated their mother right Nick Nolte is a man on a quest for redemption. He knows he has not led a life to be proud of, but he is trying and he is only looking for a break. Nolte, renders a heartbreaking performance here, seeking only forgiveness from the son he let abandon him and the one that stayed behind to win his approval. That O'Connor develops the relationships with both sons to the point his final shot boils over with redemption is a true testament to both Nolte's performance and the craft of the storyteller. (Joel Edgerton) face some tough decisions. On the other side of Tommy and their father we have Brendan, a family man and high school physics teacher who can't make ends meet and is ultimately given no other choice but to return to his old stomping grounds as an MMA fighter. As Brendan, Edgerton is more than able and it is refreshing to see him getting some well deserved attention after years of bit parts and a breakout role in last years "Animal Kingdom". Edgerton is a talented actor and portrays the difficult task of the underdog into a completely believable fighter who deserves to be competing at the level his brother and their opponents have reached. It is with the biggest winner-takes-all MMA tournament in history called "Sparta" and a cash prize of five million that draws the two estranged brothers to the same arena. It never comes off as convoluted as it might sound, in fact it unfolds at such a nice pace the anticipation to see them duke it out and the tension with which relationships are pushed is a true cause for any audience member to be biting at their finger nails. The angles with which the writers use to motivate both characters for winning their respective bouts and the way in which they round out the mysterious Tommy come in perfect stride and are both so selfless it is hard to really root for one brother over the other. It is this special weapon that separates "Warrior" as a standard sports flick. comes to a boiling point. Going into the final showdown between Tommy and Brendan (which you know happens if you've seen the preview, no spoilers here) I genuinely couldn't decide which way the movie might sway. You won't find the answer here either, but to its credit the film creates such understandable circumstances and reasons you could root for either and down to that last minute you are wondering what the outcome might be. Sure Brendan is pegged as the underdog, the one who wasn't supposed to make it past the first round (and cheers to the writers for not giving him the easiest path to the championship bout either). Then you have Tommy, his motivation is less clear and his attitude has been questionable which at certain times allowed you to feel like he would be easy to root against, but Hardy is such a gifted actor, that he barely speaks a line of dialogue and you can feel his pain, his insecurity, and his remorse. Both of their desire's to win override any sense of brotherhood, they fight to survive not just to claim a title. It is that reasoning, that drive that will make you stick with "Warrior" till the end and then leave you wanting more. It should seriously be noted that Nolte deserves recognition for his role here and as far as figuring out who wins in the end, well, you'll just have to see it to find out. Trust me when I say, it's totally worth it.